What is the correct name for this data object? What is the second model object called? I have heard it referred to as a "Data Transfer Object," a "Value Object," and a "Model Object." This object is typically necessary because the data being presented in a "View" is almost never in the same form as the data being stored in the data store. Four or five (or more) DAOs may be pulled together in the service or controller to populate this object, and it may be used to update more than one DAO on the way back to the data store. So, what is the "proper" name for this second model object? Use whatever term you and your team are comfortable with, as long as you're consistent. I thought "Data transfer object". If its responsibility is to hold model data in a format convenient for the view, then I would call it a ViewModel. I'm probably thinking about this differently than most, but to me the complex amalgum of all the different DAOs is the model. As in, that is your Business Model of the data. I'd then draw a separate little "DataStore" entity (with, perhaps, a "*" to indicate multiple) with the classic cylinder "disk" graphic, and hang it off Model. Alternatively, I'd suggest you call it "Business Model". @MetaFight " View Model" is O.K. too. Not the answer you're looking for? Browse other questions tagged design-patterns mvc or ask your own question. 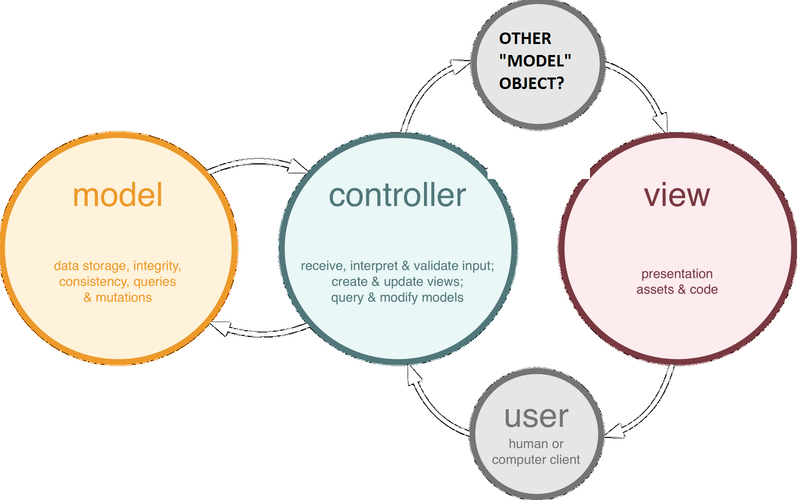 Should the controller pass data to a view in the MVC pattern? MVC: Where is the right place to set error messages? In ASP.NET MVC, should the view models have an ID? In MVC + SOA Architecture, What is the Rationale for Placing Business Logic in Models?